On a lot of survival sites, you’ll find plenty of articles about how to start a fire; unfortunately, not many of them focus on fire prevention or planning and preparing for what you should do should the worst happen and your home starts on fire. Home Fires: How common are they and what can you do to prevent them? The use and control of fire by people in order to generate light, heat and prepare food is considered to be one of the greatest advancements of the human race. Today, we take it for granted, but it is used in controlled settings by us almost every day, especially in our homes. But what happens when fires grow beyond our control? Home fires can be devastating, occur rapidly and can cause extensive damage to property and to people especially children, the elderly and the disabled. According to FEMA, in 2017 there were over 3,400 fatalities attributed to fires, with 23.0 billion dollars’ worth of losses from over 1.3 million fires that year. And although the National Safety Council has reported a decrease in fatalities from fires, down from approximately 5,800 in 1980, the data from these agencies still indicate that death and injury by fire are significantly higher than it should be. The NSC reported that it is still the third leading cause of death for children between the ages of 1 to 14. When fire strikes in the home, it is quick, and as highlighted above, it can be deadly. It takes less than 30 seconds for a small fire to become a major one. However, the response time requirement for fire departments according to the National Fire Protection Association (NFPA) is 80 seconds, which means once they hear the alarm they have 80 seconds to leave the station. Now throw in travel times, which they estimate at an average of 4 minutes from the fire station to the fire, and you can see that once first responders make it to the scene, there is a good chance the situation has already turned deadly. After looking at response times, and keep in mind we didn’t factor in the time it takes for you to call 911 or the time it takes for them to trigger the alarm, it’s important to look at both the fire risks in your own home and prevention methods to avoid major fires. After looking at the risks in your home, it’s then important to formulate a plan and practice responding to fire emergencies with your family. In order to understand how to prevent home fires, you must first understand what elements have to come together to produce a fire. The fire triangle describes the three elements of any fire, which consists of heat, oxygen, and fuel. To extinguish a fire, one of these elements must be suppressed because a fire cannot be sustained without the presence of all three factors. 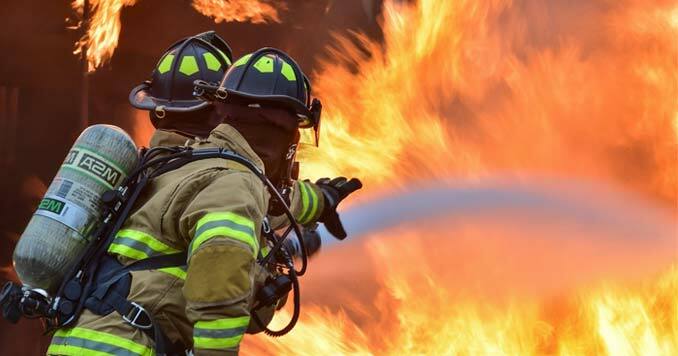 Fires extinguishing agents such as water, sand, blankets or chemical suppressing agents can remove oxygen or lessen heat, which in turn reduces and extinguishes the fire at its source. The National Safety Council reports that cooking equipment is the primary cause of home fires, followed by smoking. Over 50% of the residential building fire events that occurred in 2016 were caused by cooking. Another cause that is gaining more prominence as modern society and technology advances is the use of electrical equipment and their associated charging devices. Two lesser-known factors that may also cause a fire are batteries and pyrolysis. Cooking equipment — for example, stoves, microwaves, ovens, and toasters — can cause fires, particularly when food is left unattended. It is important to always to monitor food while it is being prepared and keep young children out of the kitchen so that they don’t inadvertently cause a fire or become burned by hot flames or surfaces. Additionally, any utensils or items like oven mitts or dishcloths should be kept away from appliances that create heat, especially the stovetop. A quick way to extinguish minor cooking fires is to place the lid over the fire to remove the element of oxygen. This should only be done if the fire is small and there is no risk of injury. A fire extinguisher should be kept in the kitchen that is capable of handling grease fires, such as an all-purpose portable ABC fire extinguisher. Never use water on a grease or electrical fires; this will only make a bad situation even worse, and it will do nothing to extinguish the flames. In fact, it could make the fire even larger. Believe it or not, smoking is still one of the top reasons for home-related fires. Throw in the legalization of Marijuana in many areas of the country, and you have yourself a recipe for disaster. For people who smoke, it is best to use fire-safe cigarettes and smoke outside whenever possible – trust me, it’s not only safer, but your guests will thank you when they don’t go home smelling like they just walked out of a bar. Smoking in bed should be avoided; most smoking-related fires start when someone falls asleep with the lit cigarette, and it then falls which onto the bed, carpet or materials on the floor. Cigarettes should be carefully extinguished in deep ashtrays, using water or sand whenever possible to ensure that the butts are no longer producing heat. Lighters, matches, and cigarettes should be kept away from the reach of children. For those homes in which medical oxygen must be used, smoking should not be permitted, and candles, matches or other ignition sources must be kept away from these units. Overloaded electrical circuits with multiple heating appliances. Old and frayed charging cords. Electrical cords should always be in good working order, and only one heating appliance per electrical port should be used at a time. Extension cords should never be used with heating appliances, and their use should only be temporary with other electrical devices in order to reduce electrical fire risks. That damn lint can be a killer! Dryers are an often overlooked source of household fires. These appliances should always be used with a lint filter that is cleaned after every load of laundry is completed. Air exhaust vents should be periodically checked for blockages, and the vent pipes should be cleaned of lint at least once a year. Batteries and pyrolysis and lesser-known causes of home fires but their risks should be understood as they can cause equally devastating fires. 9-volt batteries may cause fires when the terminals of two batteries accidentally come into contact with one another. This can happen when batteries are discarded into trash bins or recycling containers. To avoid this, duct tape can be placed over the terminals so that the risk of contact is minimized. Pyrolysis is a term that describes the contact of combustible materials with heat sources of 212⁰F or more. Examples of this can include improperly operated heating systems or chimneys that are not carefully maintained. The combustible materials eventually break down and can ignite without the exposure of a direct flame. Homeowners should always leave space between any type of combustible material and a heating source and remind all members of the family, especially children to ensure that items left around the house are kept at an acceptable distance away from these heating sources. 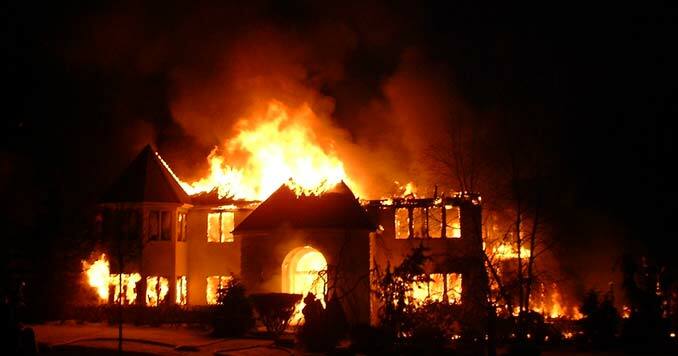 In a home fire, you have less than minutes to escape. That make smoke detectors, especially when people are sleeping, vital to your ability to survive a fire. Between 2012- 2016, 60% of all home fire deaths happened in homes where smoke detectors were either not present of not working. As soon as you hear the sound, you need to get outside and stay outside. Your alarms all need to be interconnected. When one sounds, they all sound. You should test your alarms once a month and all alarms should be replaced every ten years. Alarms should be installed in and outside of every sleeping area in your home. Install alarms on every level of the home. Smoke alarms may even come equipped with strobe lights or bed shakers for those who are deaf or hard of hearing. Home fire sprinklers control fire, so everyone can safely escape. If you don’t have a sprinkler system in your home, you need to seriously consider installing a system throughout your home; it’s like having a firefighter on call inside your home 24/7. Sprinkler systems, both residential and commercial, have been found to reduce fire deaths in the majority of cases where they are present. 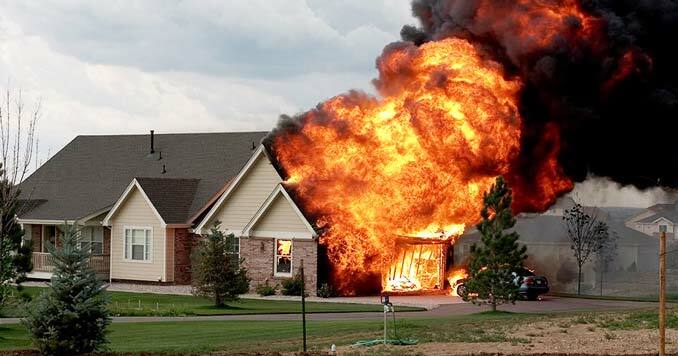 While safety is the foremost concern, home fire sprinkler installation may have benefits that exceed property and life preservation, such as the lowering of insurance premiums as well as a reduction in the amount of water used to extinguish a fire as opposed to the huge amounts used by the fire department. Sprinkler heads only activate in areas with fire, thus saving you a lot of money in potential water damage. Water damage from fires suppressed by a home sprinkler system average $2,200 in cleanup costs; water damage from a fire suppressed by a fire department average $45,000. Fire sprinklers are so effective that they often put out a fire before the fire department arrives. Most furniture and modernday goods are made of plastics and synthetics that make fires burn faster – and they produce deadly smoke. Still not sure about Sprinkler Systems? Fire Extinguishers: There is a Difference! When selecting a fire extinguisher, it’s important to choose the proper one for your situation. 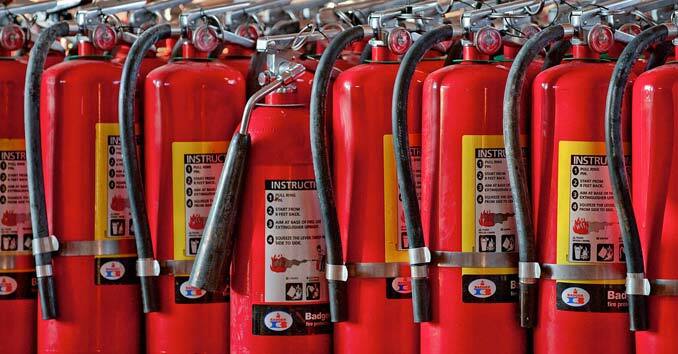 Fire extinguishers are divided into four categories, which are based on the type of fire. They also have a numerical rating which tells you what the extinguisher can handle. A higher number means more power to extinguish the fire. It is Extremely Important to use the right type of extinguisher. Using the wrong one for the wrong type of fire can be Extremely Dangerous. Class A Extinguishers are used to put out fires caused by ordinary materials such as paper, wood, and most plastics. The numerical rating on these extinguishers tells you the amount of water it holds. Class B Extinguishers are used on gasoline, kerosene, grease and oil fires. Class C Extinguishers are for electrical fires. You should never use water to extinguish class C fires because of the risk of electrical shock. Class D Extinguishers are for chemical fires and are not commonly useful for household needs. They are most often used to out fires that involve combustible metals. First Alert Fire Extinguisher For Class B&C, This one is great to have in every room of your house and your vehicle! It small and cheap enough to have a couple of them. Fire Drills: The Most important part of any Plan is Practicing the Plan! If you woke up tonight to the sound of a smoke alarm, would you have enough time to escape? If you have small children, older adults or people with disabilities, would they be able to get out on their own? A fire escape map that shows children the safe exists and alternative routes for evacuation including the meetup point outside. Make sure your child knows to leave, and not until they get to that meetup spot! Exiting by crawling low to the ground to avoid smoke inhalation, one of the major causes of fire-related fatalities. Testing doorknobs: Hot doorknobs can indicate a fire right outside your room. Carefully opening doors as this may cause oxygen to rush into the room and increase the size of a fire exponentially. Techniques such as the ‘stop, drop and roll’ in case clothing catches fire in order to avoid burns. Quiz your children every six months so they remember what to do, where to go, and who to call in an emergency. How to dial 911 and what to say to first responders. To be able to give their home address to 911 operators. The best access/egress points and alternative routes depending on the location of a fire. There should always be at least two evacuation routes in order to escape a household fire. 911 and assistance phone numbers (fire, police, ambulance, etc.) should be posted on the refrigerator or posted in an area of high visibility in the house and children regularly quizzed about this information. Older people, the disabled, or those with medical conditions should be placed near an exit in the house for easy and quick escapes. Homeowners should be in contact with their insurances providers to understand how they may be covered in the event of a fire and should a fire occur, the agent must be contacted as soon as possible so that they will be instructed on how to document fire damage. Photo evidence is critical, and lists should be created to inventory the damaged items for claims purposes. Damaged goods should be kept until instructed otherwise by insurance agencies, and once the property is deemed safe for re-entry, appliances should not be re-connected unless checked by a licensed professional. If the property is held under a mortgage, the lender must also be contacted to inform them of the fire event.